We’d love your help. 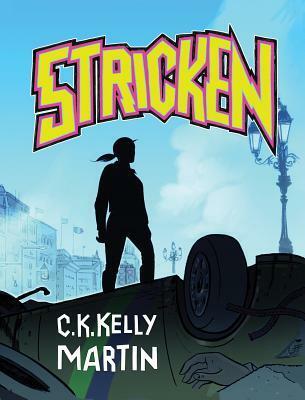 Let us know what’s wrong with this preview of Stricken by C.K. Kelly Martin. Naomi doesn't expect anything unusual from her annual family trip to visit her grandparents in Ireland. What she expects is to celebrate her thirteenth birthday, hang out with her friends Ciara and Shehan, and deal with her gran's Alzheimer's. What she finds is a country hit by an unexpected virus that rapidly infects the majority of the Irish population over the age of tw Naomi doesn't expect anything unusual from her annual family trip to visit her grandparents in Ireland. What she expects is to celebrate her thirteenth birthday, hang out with her friends Ciara and Shehan, and deal with her gran's Alzheimer's. What she finds is a country hit by an unexpected virus that rapidly infects the majority of the Irish population over the age of twenty-one. To ask other readers questions about Stricken, please sign up. I'm putting Stricken in the teen horror genre. It's a watered down version of a zombie virus story. No one is dying but the adults are losing their memories. The virus has been compared to Alzheimer's disease. Naomi is visiting her grandparents in Ireland. Her family visit every year. She has made friends with some local teenagers and isn't expecting anything different from the previous years. There is a cute boy she likes but that's about as crazy as it may get. When Naomi and her family arrive I'm putting Stricken in the teen horror genre. It's a watered down version of a zombie virus story. No one is dying but the adults are losing their memories. The virus has been compared to Alzheimer's disease. When Naomi and her family arrive things start to get a little strange. A lot of people are beginning to suffer from memory loss. Eventually, patterns begin to form. Naomi and her friends seem to be ok and realise they need each other to survive. This is a mystery that slowly unravels. Something is out there but can the teens figure it out. This is a continuous story and is only the beginning. I was expecting a post-apocalyptic read but this book was more focused on the virus taking hold of people. 3 stars out of 5. This book will best suit the teen intended audience. Naomi and her parents spend every summer in Ireland visiting her grandparents though she knows this summer will be different since her grandmother’s Alzheimer’s diagnosis. Naomi’s braced for changes and forgetfulness in her grandmother, what she and no one else expected is that something that mimics the symptoms of Alzheimer’s is infecting other adults, leading to chaos, danger, and kids fending for themselves. Naomi feels as if she’s fallen behind her Irish friends maturity-wise, so the story gi Naomi and her parents spend every summer in Ireland visiting her grandparents though she knows this summer will be different since her grandmother’s Alzheimer’s diagnosis. Naomi’s braced for changes and forgetfulness in her grandmother, what she and no one else expected is that something that mimics the symptoms of Alzheimer’s is infecting other adults, leading to chaos, danger, and kids fending for themselves. Naomi feels as if she’s fallen behind her Irish friends maturity-wise, so the story gives her a solid arc, you see growth in her as she’s challenged to care for her mother and make life or death decisions with/and for her friends. I also enjoyed that throughout she makes lists, sometimes random just to keep herself occupied or in case she too forgets and at other times poignant, it was a clever way to get to know the character better, and to break up the narrative a bit. The reason I occasionally liked a break in the narrative is because occasionally it felt like it lacked forward momentum with lengthy passages of listening to news updates or collecting supplies from one place and bringing them to another, some of that seemed as though maybe it could have been condensed in favor of scenes with more pace, a bit more dialogue maybe. I would have loved more conversations between Naomi and her friend, Ciara, for once, a conversation about their potential mutual love interest, not only would it have made me feel more assured that no one broke any sort of friend code, but to me, middle-grade is the perfect place to prioritize female friendship, particularly to prioritize it over romance. Not that I disliked the possible romance, it just kind of felt unnecessary, I would have been good with a solid friendship between a girl and a boy that hinted that something might develop in the future when everything calms down. Also, it should be noted for those who don’t care for romance, there isn’t a lot of it, it doesn’t monopolize the story. To me, the most intriguing relationship in the book belonged to Ciara and her half-brother, it’s an unusual dynamic, and I wouldn’t have minded if Ciara had her own POV in the story to spend a little more time exploring that situation. While the pace certainly picks up in the final third, the biggest problem for most readers will likely be the ending or lack there of, while an interesting plan of action is set in motion, there aren’t really any answers. Stricken by C.K. Kelly Martin is a really awesome book! And the cover looks like a superhero that has risen from chaos, right? Or is it just me? Lol. I was really excited to read this because it sounded really good and guess what? It is! No disappointments here. Stricken brings you action, thriller, and a tale between family and friends. Naomi is in Ireland with her mom for their summer vacation with her grandparents. Strange things begin to happen until one day, she wakes up with her grandmother and grandfather not remembering who they are. It started with the seniors, the old ones. They forgot their memories, some seemed like a blank page while most of them turned violent and ruined everything they see. It was really scary to think that what if something like that happened for real? Yikes! The characters are pretty great. They’re mostly teenagers who were left and I like that they’re being smart to do what should be done to survive. It’s like another version of Survivor, only with teenagers (really young teenagers) but they aren’t competing against each other. It was a really awesome read. I wasn’t able to put it down especially when all the action started. Though I found myself kinda losing it with the mention of aliens. I just don’t feel them being in the story, lol. And the ending! I need more and demand more! Oh God if someone would see my face when I finished it, wtf. I’m actually hoping there would be a second book. Pleaseee, let me have more! Naomi and her mom are looking forward to spending time in Ireland with her mother’s parents. She is also looking forward to spending time with her friends Ciara and Shehan during their time there. She has gotten to know Ciara and Shehan very well as they make the trip once year. Naomi doesn’t expect that this year will be any different than the years before except this year she will be celebrating her thirteenth birthday with a bar-b-que. Naomi’s gran has Alzheimer but she seems to be getting wo Naomi and her mom are looking forward to spending time in Ireland with her mother’s parents. She is also looking forward to spending time with her friends Ciara and Shehan during their time there. She has gotten to know Ciara and Shehan very well as they make the trip once year. Naomi doesn’t expect that this year will be any different than the years before except this year she will be celebrating her thirteenth birthday with a bar-b-que. Naomi’s gran has Alzheimer but she seems to be getting worse. They don’t think anything of it until her grandad starts to forget things as well. Sometimes he thinks Naomi’s mother is a little girl and that Naomi is her mother. After her grandad gets sick her mother decides to take them to the ER. Where they find out that her grandparents are not the only ones getting sick the hospital is filling up fast and everyone is advised to keep their sick at home unless there is a medical emergency. After returning from the hospital after being there all day with her parents Naomi’s mother starts to forget things. They learn from watching the news that a virus has hit Ireland and is hitting hard and has infected almost everyone over the age of twenty. Naomi, Ciara and Shehan are left to take care of themselves after everyone gets sick. They all hold up in Shehan’s home hiding out from the world just trying to survive and stay alive. Naomi starts writing a dairy about her life and her memories so that when she starts to succumb to the virus she can read it and hopefully it will help her to remember who she is. When Ciara’s little brother Adam runs away after they get into a big argument like most brother and sisters do the three of them go looking for him to bring him back. Adam thinks Ciara is mad at him and doesn’t want him around especially now after their parents are no longer around. While they are looking for Adam they meet more of the infected some are calm but most will just as soon kill you as look at you for no reason what so ever. The infected are not the only thing they have to worry about or hide from no there is something else out there with them, they are not alone. Can they find Adam before it is too late? Will one of the infected find them? Or will whatever is out there beside the infected find them? Who will find them first? Can they survive alone in a world gone mad? What has happened to the people of Ireland? Stricken is a fast read with action around every corner that will keep you hanging on for more. I loved the new twist on sort of zombie like virus that was taking over the adult population. I love zombies and aliens and loved seeing the aliens in Stricken but I would like to know more about them and where they came from and why they are here. Where did the virus come from? The ending left me hopeful that there would be more stories and I can’t wait to find out more about Naomi, Ciara, Shehan, Adam, the aliens and the infected. I can’t wait for the next book. MG. When Naomi goes to Ireland for a month, for her usual vacation away from Toronto, she's excited to see her friends Ciara and crush-worthy Shehan. While prepared to deal with her Gran's emerging Alzheimer's, she's stunned when a group of older adults, and then younger ones, including her own mom, come down with a strange amnesiac disease. Reasoning has no effect, and the strange and impulsive behavior leads to a mass quarantine, with hordes of adults being contained by the government for thei MG. When Naomi goes to Ireland for a month, for her usual vacation away from Toronto, she's excited to see her friends Ciara and crush-worthy Shehan. While prepared to deal with her Gran's emerging Alzheimer's, she's stunned when a group of older adults, and then younger ones, including her own mom, come down with a strange amnesiac disease. Reasoning has no effect, and the strange and impulsive behavior leads to a mass quarantine, with hordes of adults being contained by the government for their own safety. Stricken is a the story of a group of teens living in Ireland whose world turns upside down when a strange virus begins to attack adults, leaving them with symptoms akin to Alzheimer's. Naomi must use all of her resources as the adults in her life slip away and survival becomes more and more elusive. Younger teens who enjoy sci-fi thrillers will delight in Naomi's endurance and fortitude. The novel is somewhat unresolved at the end, perhaps there will be a sequel? A family vacation is supposed to be fun. But what if your family vacation turns into the worst nightmare imaginable? That is what happens to Naomi and her family on their Irish vacation. Naomi faces perils that no one should have to face. Her struggles, failures, and triumphs kept me reading until the conclusion. I received this book as part of the Goodreads Giveaway program. The story is fascinating. I really enjoyed the second half of the novel better than the first. The first half of the novel came across a little too staged - where things fell into place too predictably. This is a good book for young adults and would keep them engaged. Aliens aren't my cup of tea though. I also didn't like that the ending left one hanging. A second book is sure to come!